If a payment occurs regularly — the payment might be for a loan or some other regular bill like your cable TV service — you can use Quicken to set it up as a scheduled payment. When you do so, Quicken automatically records the payment for you based on a schedule. 1. Choose Cash Flow –> Calendar or press Ctrl+K. 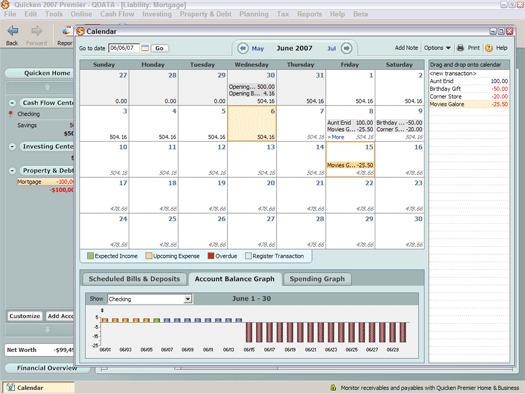 Quicken displays the Calendar window, as shown in Figure 1. The figure shows a calendar for the current month and, optionally, a list of memorized payees. Note: If you can’t see the list of transactions along the right edge of the Calendar window, choose Options –> Memorized Payees List. Figure 1: The Calendar window. 2. Display the first month for which you want to schedule the transaction. Using the Prev Month and Next Month buttons, select the starting month for the scheduled transaction. You can also click the Go To Date button. If you do so, Quicken displays a dialog box that you can use to specify the precise date you want to schedule a payment for. 3. Identify the scheduled transaction and date. Select the transaction for which you want to create a schedule. In Figure 1, for example, you may want to schedule the payment to Movies Galore to fall on the 15th. To do so, select Movies Galore from the payee list by clicking it. Then drag Movies Galore to the 15th. When you release the mouse button, Quicken displays the Add Transaction dialog box. 4. Identify the account from which the payment should be made. Open the Account To Use drop-down list box and then select the appropriate account. 5. Verify that the transaction type is Payment. 6. Check the payment scheduling stuff. Verify that the Start On box shows the correct date for the first payment. If this is a recurring payment, use the How Often box to specify how frequently Quicken should remind you about this payment. Finally, if you want to get really crazy, use the Scheduling Options buttons and boxes to more precisely specify when you want to make payments or be reminded about payments. 7. Verify that the Pay To, Category, Start On date, and Memo fields are correct. Quicken adds the payee’s transaction to the calendar. Note: When you schedule payments, you may implicitly break your budget. If you’ve set up a budget and scheduling a payment does “break” the budget, Quicken alerts you. Quicken also asks (in the nicest way possible) if you want to update your budget.